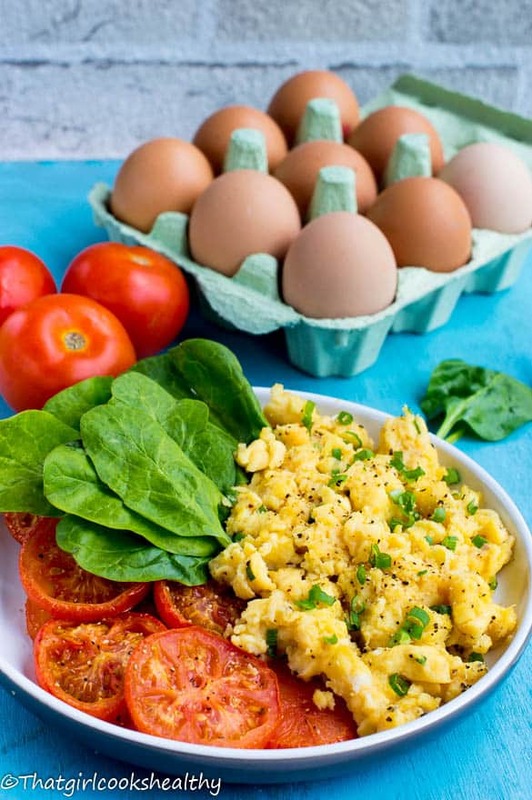 Scrambled eggs and tomatoes – this breakfast egg recipe is low in carbohydrates with packed with healthy vegetables and moderate fats. 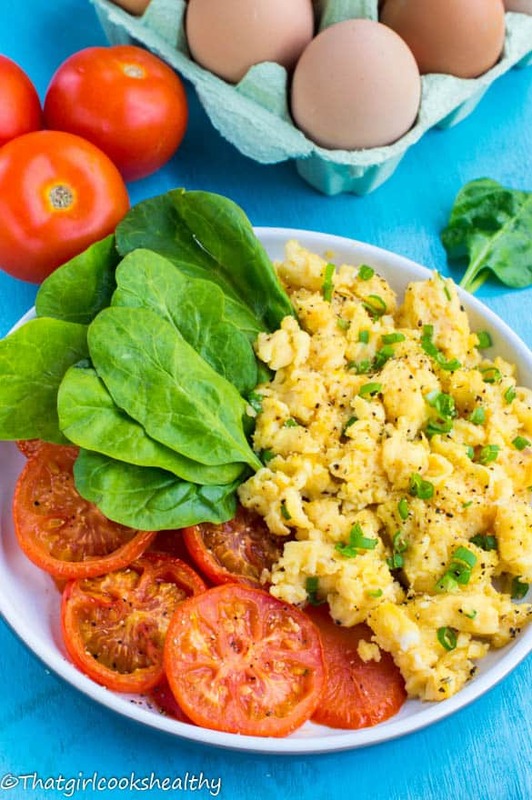 Another breakfast recipe coming your way, this scrambled eggs and tomatoes is very simple and so easy to make it’s ridiculous. I have badgered you many times about the importance of eating breakfast in the morning and now I’m going to go one step further by creating a selection of quick and tasty recipes to eat. I love eggs, what I love even more so are free range eggs, eggs that haven’t been layed by a bird that’s riddled with growth hormones due to being confided to a cramped cage. I paired the eggs with some tomatoes that were partially roasted, partial being the operative word here. I like mine tomatoes to be slightly plump, so I drizzled a generous amount of oil on both sides. If you want them to roast fully then I suggest a light coat of oil which placed on some parchment paper for a few minutes longer than what I did. You’ll be pleased to know there’s not a great deal of fuss with this recipe. 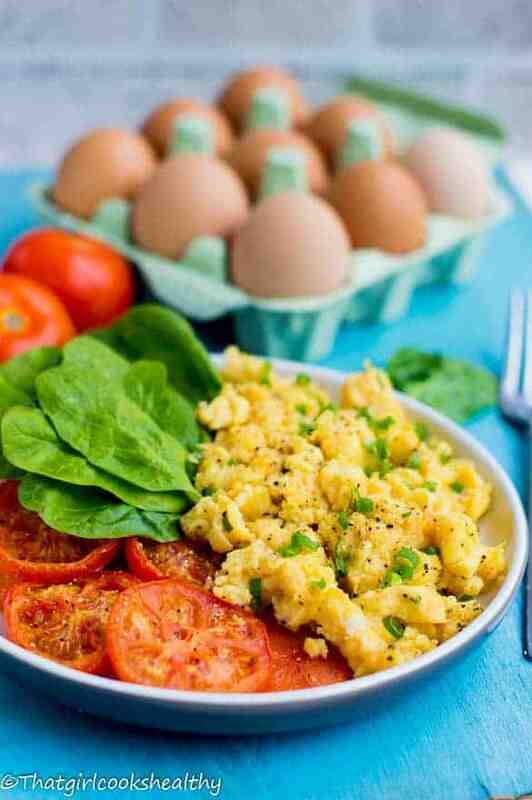 The scrambled eggs are lightly seasoned with chives, black pepper with pinch of salt and a dash of garlic pepper. The tomatoes are garnished with black pepper and salt, again nothing too extreme. The entire egg is a good source of protein and fat, thus supporting healthy thyroid hormone thanks to the iodine. 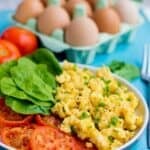 Moreover, the recipe to hand is a great weightloss or muscle building meal, to bulk up on the protein simply opt to scramble some white eggs instead. Add some fresh spinach leaves as a side serving, it gives this wonderful crunch. Preheat the oven at gas mark 4 or 180 degrees. Arrange the tomato slices on a baking tray lined with parchment paper. Coat both sides with coconut oil and the extra sprinkling of black pepper and salt. Roast in the oven until your preferred result, the longer they roast the drier they become. I partially roasted for approximately 4 minutes. Meanwhile,heat a non stick frying pan with 1tsp of coconut oil, quickly pour in the eggs and whisk the eggs so they start to cream, keep whisking until it creams and lifts away from the pan in segments. Then add the black pepper, garlic pepper, pink salt and chives. Beautifully presented Charlene! This picture looks so appetizing. I was pleasantly surprised to see that you didn’t add any dairy or butter into the eggs, and it still looks like such a fluffy outcome. What heat do you use for the eggs – low or medium? I was wondering how long they take to cook – how long should you be standing there whisking for? No definitely no dairy used for this recipe. I highly recommend using a good sturdy non stick pan as this eliminates the use of fat and yet yields that fluffiness. I scrambled the eggs on medium heat for approximately 2 minutes, so nothing too tiresome.